When you want top of the line quality in a wall-mount hoop, our best-selling, regulation-size 72" x 42" GS72 is the obvious choice. 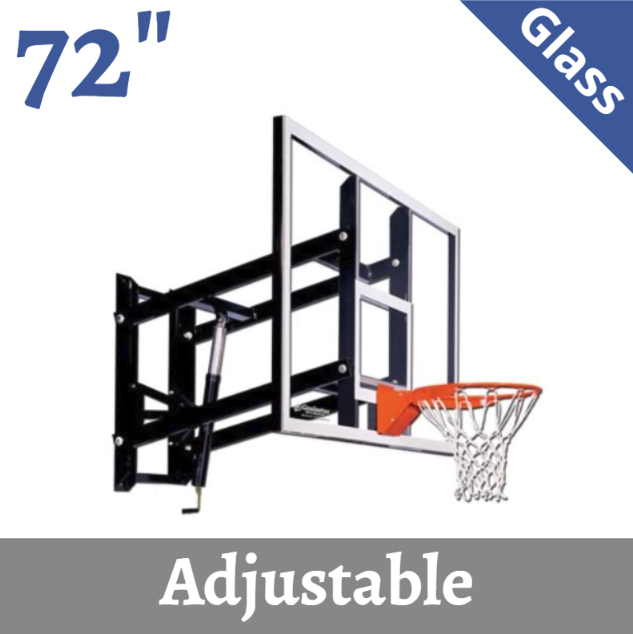 Suitable as both an indoor or outdoor basketball hoop, the GS72 features a 3' overhang, a tempered glass backboard and rugged steel backboard frame. 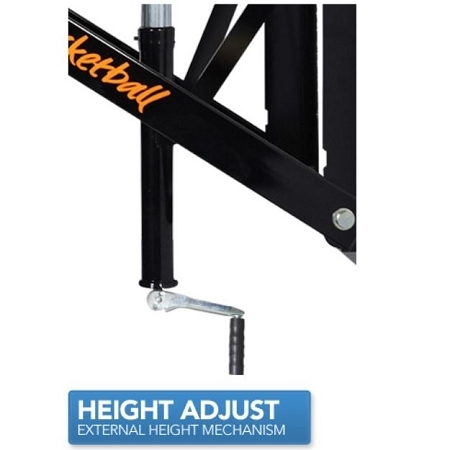 The external compression height adjustment mechanism provides smooth and effortless height adjustment from 6' to 10'. Every component of the GS72 exceeds the most stringent industry standards, and like all Goalsetter basketball systems, is manufactured in the USA with unmatched quality and workmanship. 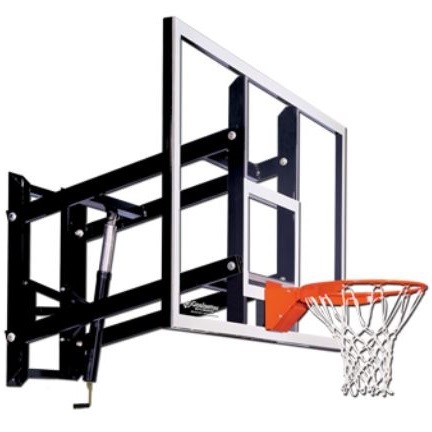 1-2 business days: This wall-mount basketball hoop is typically in stock and should ship from Goalsetter within 1-2 business days. This system has a sleek design and is very sturdy. It works great for our garage and our kids love it. This hoop looks very impressive for the cost. We love that it goes down to 6 ft. to get more use out of it for our small children. This is a very solid hoop. The play on the system is very similar to shooting on at the high school gym. Our boys love playing on their new hoop. This hoop is very sturdy and plays great. The kids love shooting on it and it is easy to raise and lower. Q: Is there no longer an option to upgrade the rim? 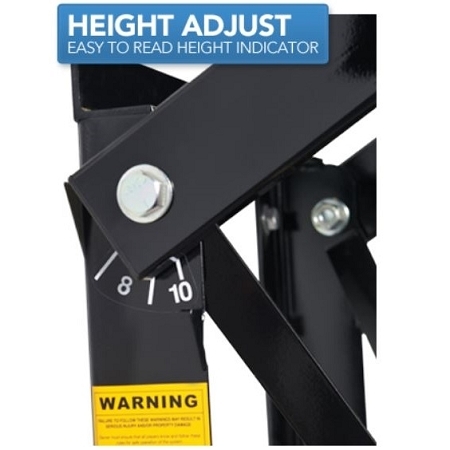 Q: What is the dimensions on the mounting bracket? Does it come with the HD flex rim as noted? A: This rim only mounts onto the Goalsetter backboard. It is not interchangeable with other brands. This does come with the HD flex rim. Feel free to contact us with any other questions. Q: What size do they use in the NBA? A: In the NBA the use 72 inch backboards. Q: Does this have a spring-loaded rim for slam dunking? A: It is one of the options. During checkout you simply choose the drop-down menu. Automatically it comes with a static rim, but you can upgrade it to a spring-loaded rim. Fast Shipping: Orders for the MG45072G3 generally leave the warehouse the next business day. Dimensions: 74" x 45" x 20"